Will Graffiti Artist BNE Be Unmasked In NYC? The internationally known (or rather unknown, since his identity is a mystery) graffiti artist will have his first gallery show this week in NYC. 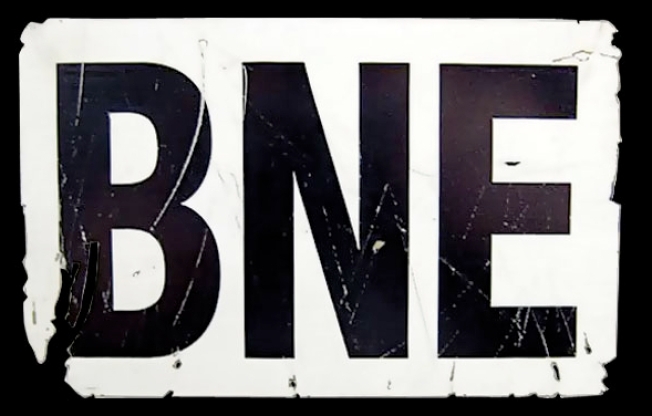 Theories abound as to the identity of the graffiti artist known as BNE, and there was even speculation that he would appear at a gallery show of his work in New York. Forgetting for a moment his identity, it's not even known what BNE, the letters that are his tag and signature, even stand for. A reporter from the New York Times spoke with BNE in anticipation of his first-ever gallery show, opening this Thursday in Midtown, and after speaking with BNE wrote, "His accent and knowledge of local artists suggests he is from New York," though the artist wouldn't divulge any identifiable information. Rivaling the mystery is the mythic stature the artist seems to be aiming for. He's created a mural in Japan that Bucky Turco -- one of the editors of Animal, the online magazine that is sponsoring the gallery show along with ad agency Mother -- says is visible from space. His face has never been photographed (though some shadowy hooded shots appear in the Times story). He's a wanted man in San Francisco, where the mayor offered a reward for information leading to the BNE's capture after he bombed that city. He's equally well-liked by New York officials (Peter F. Vallone Jr., of Queens, chairman of the City Council’s Public Safety Committee, called him an "an unrepentant criminal"). He's most made his mark on NYC and Japan, though the stark trademark can be also be found in Bangkok, Prague, Hong Kong, Madrid, and Kuala Lumpur. BNE says he won't appear at the opening party for his show -- which will feature music by Stretch Armstrong, Treehouse DJs, and Faux Mex -- out of fear of arrest. Which is well warranted, since even artists of the stature of the "Hope Obama" famed Shepard Fairey have been sped away from gallery openings in squad cars (an arrest in February marked Fairey's 15th). But when one looks at the facts -- a mystery man based in NYC who appears only in hoodies, keeps his face obscured in photos, has plenty of free time on his hands, and the mobility to outrun the cops -- they point to only one likely candidate who could be BNE: The obvious choice is BikeSnobNYC.